I guess with like 4 other projects Neil can still fit in an adaption of one of his comics and solve world hunger too, wow. This guy is amazing, but those of us who grew up with Sandman knew he was something special all along. This looks nothing less then stellar, being a described as a "family" fantasy, horror, I guess kind of like Nightmare Before Christmas. It has the same director too, Henry Selick! Link to a clip after the break, and here's some plottage. 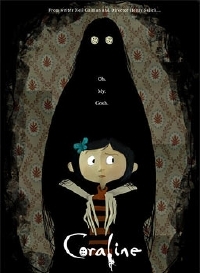 "Based on Neil Gaiman's short children's novel of the same name, Coraline is a young bored girl who discovers that bricked-up wall behind a door in her flat leads to another world, with another mother, and another father."